Just in time for Christmas….this weeks book recommendation! Do you enjoy theology? Want to begin learning it? Need a better grasp on what Christians believe, and why? If yes to any or all of these questions, then I’ve got a really good book for you. 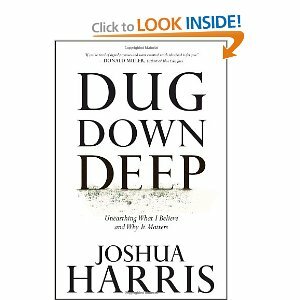 It’s called “Dug Down Deep” by Pastor Joshua Harris (Covenant LifeChurch, Gaithersburg, Maryland). I know, I know…the thought of a head-y, hard to read and frankly boring work on theology where the author seems bent on impressing you with all things academia rather than actually providing an insightful, pratical and even enjoyable book you can actually read doesn’t seem particularly appealling and you couldn’t even re-gift it…but please understand, this simply isn’t your typical theological work. It’s practical. And to my suprise (and delight) it was pleasurable. Pastor Harris has a pretty unique writing style that allows him to teach the deep things of God through instruction, personal illustration and even humor. He takes you through his own unique journey into the things and ways of God and provokes you to really examine your own belief (both the why’s ond the how’s). Anyway, it’d be a great gift and I highly….I mean really HIGHLY recommend it. I got in on Kindle (like $11 bucks) and it’s available in hard/soft copy through Amazon and of course, your local Lifeway. Seriously, read it. You’ll grow.